A short primer on global warming opens the book, in the course of which recent studies are referenced suggesting a potential one metre sea level rise this century, followed by possibly several metres within the next several centuries. The rise by 2100 may be appreciably higher than a metre, since the maximum level is still the subject of much responsible debate. The momentum of sea level rise is now such that mitigation of greenhouse gases can hope to reduce its impacts only over the long term and only to a limited extent. Adaptation is unavoidable. Fortunately adaptation avoids the gridlock of international negotiation because it focuses on more narrowly-based national, regional and local efforts to cope with sea level rise. A whole range of adaptive measures can be addressed simply and quickly, albeit still with limited effect, and much of the book is devoted to highlighting some of these in the regions to which they are applicable. Mention is made of retreat as a strategy whereby a decision is made to pull back from the coast and surrender land to the sea, and there is wry reference to the easiest and often favoured political option of “lots of talk, no action”. The writers explain some of the ramifications of a higher sea level. Storm surges are likely to be more frequent and to cause serious damage to vulnerable coastal facilities. Insurance company Munich Re estimates, for example, that along the southern shores of Long Island even a half-metre sea level rise by 2080 will mean a 73 percent increase in property loss due to storm surges. Coasts are never static. The book quotes Rachel Carson: “Always the edge of the sea remains an elusive and indefinable boundary.” But rapid sea level rise puts substantial additional strains on low-lying or erosion-subject land, on barrier islands, and on coastal wetlands and estuaries, along with causing saltwater intrusion in freshwater aquifers and surface waters. The generalities are brought vividly to life when the book moves to examine a selection of 25 cities and countries already facing or soon to be facing serious problems as the sea level rises. In the Atlantic ocean basin New Orleans faces much uncertainty as to how best to build protection, Miami suffers from “head in the sand” government mentality, and New York’s task force on the subject “laboured mightily” and in 2010 “brought forth a mouse”. Rotterdam and the Netherlands are well ahead of any other country in actually doing something about sea level rise on a highly organised national level, the Thames Barrier in London should provide protection for some decades yet, but “lovely and courageous” Venice probably cannot be rescued for very much longer. Alexandria will be 30 percent flooded by a sea level rise of between 0.5 and 1.0 metres unless effective remedial actions are taken and Lagos and the Nigerian coast will be severely affected, as will Recife and the Northeast coast of Brazil. In the Pacific basin the book considers the complex threat to the San Francisco Bay Area before moving across to the highly vulnerable coastal cities of China, where the government recognises the adverse effects ahead. Vietnam also is aware of the danger to its coastal regions and is seeking to learn about possible adaptive strategies. Bangkok faces major flooding but the Thai government is tardy in recognising the need for remedial measures. Tuvalu and Kiribati are destined to disappear beneath the waves. The developed economies of Australia and New Zealand are mentioned as well placed to implement adaptation measures, but likely to encounter considerable costs and institutional constraints as they do so. In the Indian Ocean basin Bangladesh stands out as a heavily populated country under severe threat. A one metre rise will see 50 percent of its land under water. What adaptation measures can cope with that are difficult to comprehend and the book understandably envisages drastic political upheavals if international assistance is not forthcoming. In neighbouring India, Mumbai and Kolkata face serious threats, as do Karachi in Pakistan and Jakarta in Indonesia. It is difficult to see the Maldives surviving. It’s an overwhelming selection, all the more because it is just a selection. But there are measures that can be taken specific to each region and it is the purpose of the book to urge that adaptation issues be addressed as soon and as urgently as possible. The Netherlands is advanced as a case study of how much can be done to secure even a country of which 27 percent lies below sea level and two thirds of which is subject to flooding. The refreshing realism with which they plan for future sea level rise is well recounted. The impacts of sea level rise are clearly going to be traumatic in many regions of the world, and the book does not need to underline that fact for any reader who follows its careful assessments. The sea is rising and national and local governments need to get down to the task of protecting their coastlines and populations to the greatest extent possible. If they want to prevent the sea rising to even more destructive levels than those already in prospect they will have to undertake urgent and drastic reduction of greenhouse gas emissions, but that’s a course they are collectively still unwilling to follow. Don’t follow your logic Bennydale. It’s surely deeply alarming that we are left with only adaptation to sea level rise because we have refused or been politically unable to take the warnings of science seriously. Lets see what happens tomorrow as Sandy approaches the large cities of the Eastern US seaboard. The subject might become quite topical if there is wide-spread flooding in New York. It is not possible to blame the existence of a single storm on AGW, but it does alter the probabilities. Re Sandy, sea level and surge, Kevin Trenberth has a short overview of the impacts of warming on storms at The Conversation here. I am sorry Gareth, but that link and what it discusses re:links to climate change is absolute hokum. It has been suggested that hurricanes may actually be fewer in a warmer climate. For anyone to suggest that Hurricane Sandy ( category 1 btw) is connected with climate change is madness and nothing more than alarmism. The only thing that was out of the ordinary was the location. No-one attributed the devastating hurricane that happened in New Orleans to climate change and there was much criticism of the US governments response to Katrina. And yet, here we are with a category 1 hitting New York and all of a sudden it is climate change. What a difference a location makes. As in “absolute hokum” from one of the world’s leading climate scientists. Sorry Makka, but Sandy was a storm made worse by the energy accumulating in the climate system. It’s not alarmist to point out the obvious: all of our weather is changing because we’re changing the atmosphere. See Jeff Masters today for a discussion of possible links between Sandy’s track and Arctic sea ice loss, for instance. Makka, did you even read the article? You strike me as ignorant, tedious, and lacking in technical knowledge. The location wasn’t really that surprising, the NE US coast has a history of damaging hurricanes or ex-hurricanes. What was out of the ordinary was the size of the storm and the massive area with the tropical strom force winds – a connection with climate change just cannot be dismissed out of hand as alarmist. There’s a lot of interesting discussion of this very point floating around – Joe Romm’s a good starting point. By analogy, shift the digits on a single die of pair of dice from 2-7 rather than 1 to 6 and you’re going to throw the occasional 13. In a few years time both dice wiill run from 2-7, 13s will be unsurprising, and the occasional 14 will crop up. Riase the floor on a basketball court and you’ll get more slam dunks, though there’ll still be a series of ‘causal’ plays in the lead up to each individual one. Of course I read the article. I wouldn’t have highlighted the suggested link to climate change otherwise. I am not sure how it demonstrates ignorance to point out that this was only a category 1 event. It met with a blocking high pressure to the NE which forced the hurricane westwards towards New York, rather than continuing into what would normally have been a Nor’ easter for the eastern seaboard. It also met with a cold weather system to its north west. This was a specific weather event that led to the eventual positioning of this hurricane. Had it been a category 5 barrelling down on the eastern seaboard so late in the hurricane season I may have been interested in its significance. As it stands I am not. The other point I made was about the US’s ignorance of a certain hurricane that devastated New Orleans. The only reason Sandy made news was because it landed on New Yorks shores. Back to the subject at hand – sea level rise. Without wishing to sound rather obvious – the sea level will drop again when we start the next ice epoch, just like it did during the last one when mean sea level was 120 metres lowere than it is today. I wonder how the Maldives looked then. Or the great barrier reef – well it didn’t exist did it. Is it nature’s fault that climate undualtes and at certain points provides us with natural phenomenons like these? I didn’t realise we as humans were the custodians of mother nature and should be trying to change what it does? Is it nature’s fault that we build houses within feet of ocean shores or river beds. No. It seems that everyone views climate change with subjective emotion based upon what it affects where they live. Climate changed regularly before we arrived and it shall continue to do so long after we have gone. Makka, here is another article that describes how the loss of Arctic sea ice may have contributed to Sandy making landfall. Still not connecting the dots? Is it due to climate change? Well there has been significant, tho not huge general sea level rise and some extra special sauce with subsidence in the area, and, of course, we have loaded the climate dice, so all in all, remember the word and. Truly amazing. Off the coast where Sandy is now intensifying the waters are up to 5 Deg C warmer than long term mean for the time of the year and this ocea area. An enormous amount of extra thermal energy is stored there. Temporary deviations in ocean current that may or may not cause a change in SST’s in a specific area have nothing to do with the mean global air temperature or global warming! In your world without physics, maybe. The rest of us have this thing we call ‘reason’ and a process we call ‘science’. You might look into it one day. When it comes to water, the Dutch are indeed savvy. See Google images: netherlands floating homes. Perhaps my idea of an energy dam across the Hauraki gulf is not so stupid… the sea level rise explorer Google Maps of the area shows how vulnerable the Hauraki plains are. A straight line defense linking south of Waiheke Island across the Gulf to the Coromandel Peninsula would be significantly shorter than defenses all around the shore line with the added benefits of a tidal power station with perhaps significant output and a much shortened travel time between AKL and the Peninsula. The Greenies and Iwi will have your tripes on toast. A barrage like that would totally screw the ecology of the region. Mind you, a couple of metres of SLR will have an interesting effect on the ecology too, assuming the sea water isn’t so acidic it no longer supports the current ecology. Things are always more complicated than with think. I know, and you are right. Plans like this will be a no-goer, at least for a some time to come. Once we in earnest start to discuss what we might actually undertake to mitigate the effects of the rising oceans a whole new set of compromises and negotiated solutions will need to be found. Sand bagging the coastlines won’t do and which lands will we sacrifice to the tides and which will we invest to save. Will the people of Ngatea and the farmers of the plains be compensated and by whom? The Hauraki plains are the largest swath of land in NZ where these questions will be tested. The debacle in the USA right now reminds us that we may not need to have to wait for the end of the century for these testing times to be upon us. 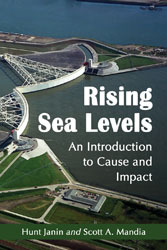 “If you’re looking for a comprehensive discussion of one of the most pressing issues on the planet…the threat of global sea level rise…then this is the book for you.”–Michael E. Mann, Penn State University, Nobel Peace Prize winner. This is an idiotic meme, andy, even by Denier standards, and I suggest you quietly drop it. If The Beatles had won a peace prize only a complete prat would claim that McCartney hadn’t – and only a galactic prat would go online claiming he’d cobbled together the certificate Apple Inc. sent him saying ‘hey, we won, thanks to you’ himself. Personally, I find this “meme” about as interesting as whether Christopher Monckton is a real Lord or not. The point often missed is that seas are going to continue to rise due both to melting ice and expansion of the sea water as its temperature rises UNTIL the climate forcing causing the ice to melt and the seas to warm returns to pre-industrial levels. This return will take thousands to millions of years while the melt of ice sheets covering Greenland and Antarctica will take significantly less time. This means that we are going to get the full melt out long before Earth cools sufficiently to see water being stored again as ice in ice sheets and glaciers. So the end point is certain, the direction is certain, and from here there is little we can do to stop it happening. This has already gone way beyond funny or sad. When you see the number or research groups there are in Antarctica and the huge cost of maintaining them you wonder who is paying for it and why. And then you discover that eleven of the fifteen major USA naval bases are at one meter above sea level and you realise that they would want to know when they would have to move them. Go to http://flood.firetree.net/ and look how much land disapears up the East coast ot the UK plus Holland, New York, Florida and California. The people of Kiribati will fit into a suburb of Auckland easily but there will be many millions of escapees from Europe and the USA for a lifeboat country like NZ. We might have some New Yorkers next week. especially the actual video of a methane hydrate eruption of a deposit disturbed by drilling at around 7:20 into the video. Well of course it is Rob – in your eyes anyway. It’s the great Class War that we learned about in the 60’s. It is also of course “the greatest moral challenge of our generation” isn’t it ? It is very perplexing though why it hasn’t been debated in the US presidential election by either candidate. Why do you think that is ? Has it become an embassment do you think ? A vote loser ? Or is it simply that catastrophists have grown weary of hyperbole and are starting to face reality ? The issue has vanished off the radar irrespective of the last 2 decade’s of panic. Pingback: Sandy, Science, and Politics « SayWhat?